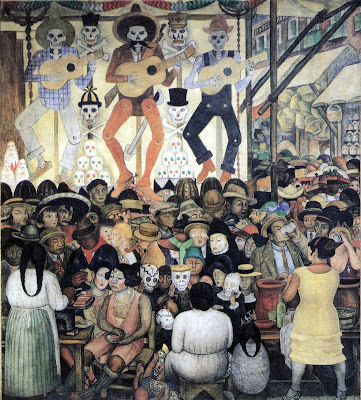 Day or the Dead or all Souls Day is celebrated for the last few days of October and the first couple of days in November in Mexico. It is a celebration of remembrances of departed relatives and friends. Food, festivities, flowers, decorated grave sites, lavish costumes and parades make up the social celebration. A time of remembrance, praying and celebration. The imagery is beautifully rich and sometimes very elaborate, sometimes playful. 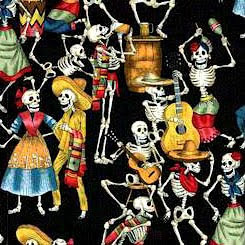 Just google some images and you come up with some very bright and fun skeletons, sculls, flowers & instruments depicting the celebration. 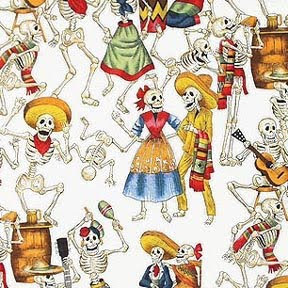 I found these fabulous Day of the Dead Alexander Henry fabrics here. I think they would be fun to use to make your own swimsuit or bikini. How theme-tastic! If you need a pattern, we have lots of vintage swimsuit patterns over at Glamoursurf. Let us know if there is something particular you are looking for as we have lots of patterns not yet listed. They would also make wonderful totes, or an apron even. There are tote, purse and apron pattens listed over on Glamourstitch. I love those Alexander Henry fabrics. I made my hubby a bowling-style shirt with a panel of the skeletons on black fabric down the front and also the pocket. Had enough left to whip up myself a little 50's drawstring bag! It's lovely fabric and great quality! I agree, they are fabulous. I would love to see his shirt and your bag!